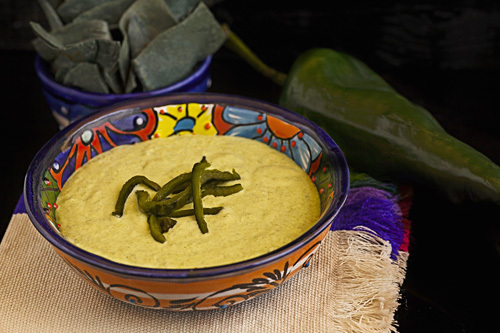 This is a delicious Poblano pepper dip that has a flavor that you don’t imagine. You may think that the dip flavor is basically strong and spicy. Which are flavors that do exist in this dip... but in the form of small notes. The reality is that the Poblano pepper dip is prepared with many ingredients and the flavors that predominate are soft and creamy . As a final touch this dip also has a slight smoky flavor that makes it the best. The result is a very original dip that can be used to accompany tortilla chips or crackers. Although more combinations can be made or it can be used in main courses like a tasty roasted potato or on some fried chicken tacos. In this recipe you will go through a ritual ;) with the Poblano peppers and then everything is easy to make. As part of the preparation the Poblano peppers are roasted, be careful because they release a strong aroma. To prepare the dip onion is used and it is fried with butter. It is very important to use the butter because it gives an intense and delicate flavor. The preparation of this dip will take you 35 minutes . The recipe is for 8 portions. Put on a griddle over medium-high heat 4 Poblano peppers and roast them for about 4 minutes, until all their sides are completely black; move them regularly with some tongs. Transfer from the griddle to a plastic bag, with the tongs, the 4 Poblano peppers that were roasted. Take from the plastic bag the 4 Poblano peppers and rinse them while removing the outer skin of the chilies (the burned part). Discard the seeds and the veins of the Poblano peppers that were rinsed. Cut the Poblano peppers into strips, put them in a blender and reserve. Also reserve 5 Poblano pepper strips to garnish at the end. The enough Water to cover the potato. Leave the potato cooking in the boiling water for about 20 minutes, until it softens. To know if the potato is ready, spear a fork in the potato. When you feel that the fork goes in and out smoothly the potato is ready. Remove from the saucepan, with a kitchen spoon, the potato that was cooked and rinse it with cold water. Peel the potato that was rinsed, then put it in the blender and reserve. Finely chop 1/2 onion, then set aside. Melt in a frying pan over low heat 2 tablespoons of butter. It is very important to maintain the heat low because if the butter burns its flavor becomes bad and you will have to start again. Incorporate in the frying pan the onion that was minced and fry it for approximately 1 minute, until it looks a bit transparent; stir regularly. Blend very well the ingredients, then pour in a bowl the Poblano pepper dip. Garnish the Poblano pepper dip with the Poblano pepper strips that were reserved. Variation: Now would you like to taste the Poblano pepper in a melted cheese ? Did you like the Chili Dip? Serve the dip in this small plastic molcajete, it will look very appealing. When you roast the Poblano peppers use some tongs like these ones so you can move them easily. In this recipe you are going to blend many ingredients and you will need a powerful blender like the ninja.